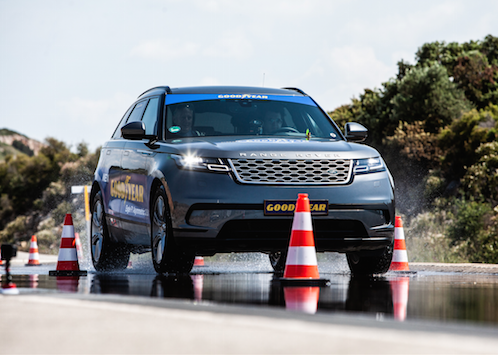 We’ve been to Goodyear’s test track in Mireval, France to test its latest tyre aimed at SUVs. In the last five years 64 new SUV models have been launched. The rise in popularity of the body style means that there is a growing need for tyres specifically designed to handle a higher weight and work load that mid and full size SUVs bring. It wasn’t that long ago SUVs were rare enough. At the turn of the century BMW had just one SUV in its range the X5 now it has the X1, X2, X3, X4, X5, X6 and X7. The average crossover is quite car like and can get by with regular car tyres. Larger SUVs generally have a much higher centre of gravity and bulk compared to a car and therefore place more demands on their tyres as they pitch and yaw more. 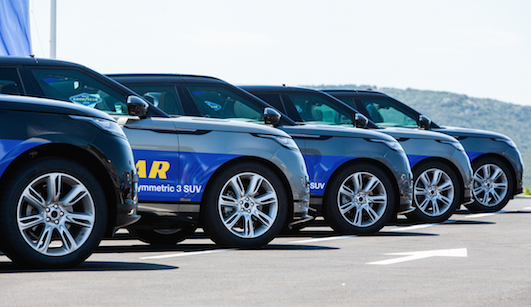 SUVs clearly are not going away so tyre giant Goodyear is targeting followers of the motoring fashion with its new tyre, the Eagle F1 Asymmetric 3 SUV. The tyre has been designed to fit wheel rims from 17 inch up to 21 inch, perfect for chunky machines like the Audi Q7 or popular middleweight SUVs like the X5, Alfa Romeo Stelvio and the XC60 to name a few. The new summer tyre, our standard Irish tyre, is an enhance adaptation of the 2016 Eagle Asymmetric 3 car tyre designed to meet a tougher workload. There is a stiffer sidewall but also some very interesting new technology in the tyre’s construction and tread. Goodyear describes its new tyre as an ultra high performance tyre specifically designed for SUVs but this conflicts slightly with its sister firm Dunlop who also makes high performance tyres for SUVs. 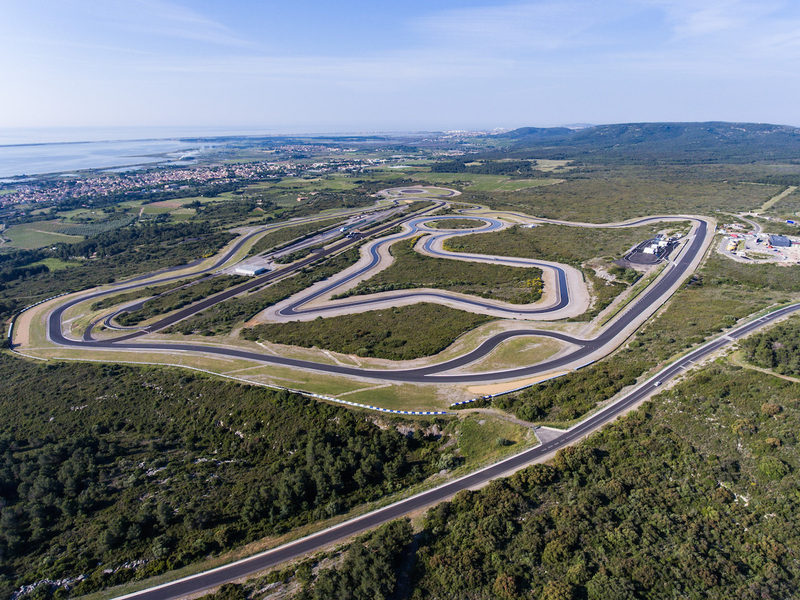 Braking and handling are quoted as strong points and we have put that claim to the test at Goodyear’s Mireval proving grounds near Montpellier, France. Goodyear’s active braking technology may sound a bit gimmicky but it describes an increases in the tyre’s footprint under braking. This action provides more grip with the surface to enable the brakes to slow the machine down more efficiently in wet or dry conditions. Grip booster technology, sounds gimmicky too, describes the adhesive compound that increases the tyre’s stickiness with the road surface. 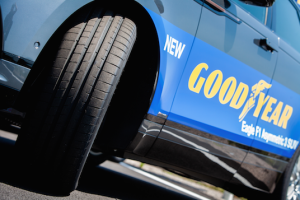 Statistics back up Goodyear’s claim of greater braking ability. The SUV tyre has a tailored construction that features a new tread pattern. Multiple layers make up the tyre’s core and new cords feature to enhance the tyre’s cornering and high speed handling. In addition tread wear has been reduced thanks to the tyre’s new cavity design. A cool cushion layer is also used to improve handling, reduce rolling resistance and thereby reduce fuel consumption. Our test cars were Range Rover Velars shod with 255/50/20 Y rated tyres circa €380 each. We put the premium two tonne 5 seat SUV through a number of practical tests in between attending technical workshops. Bullet proof technology: Tyre construction is quite technical and with close to 60 different materials used in the Eagle Asymmetric 3 SUV tyre one or two ingredients stand out. A tyre is least technical on the inside where it features normal rubber on the inside of the carcass that only has to hold air, a couple of steel belts help secure the tyre to the rim and keep it on the wheel, the carcass has a couple of steel radial layers that look like a mesh and on top of that sits a fabric hybrid overlay cord mesh (woven in to the tyre) and finally there’s the famous tyre tread itself. A new and very strong fabric cord made using a combination of a nylon thread with an aramid thread wound around it is astonishing. Aramid is a material used in ballistic bullet proofing. The nylon thread has some give when stretched to its limit while the aramid, though stronger, is more prone to snapping when it reaches its tensile limit. The two materials don’t get along so an adhesive of carbon black is used to bond them together. The result allows the tyre deliver a greater degree of high speed stability while also remaining flexible enough to be comfortable for passengers. This new cord gets its first outing in the SUV tyre. 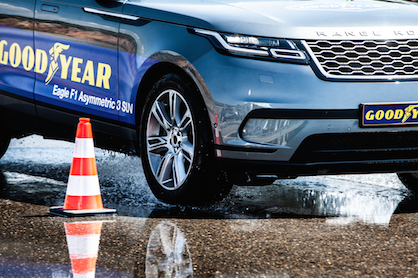 Slalom and dry braking: A slalom through cones followed by a sprint then emergency stop gave us our first glimpse in to the exaggerated dynamic forces an SUV tyre has to go through. The tyre was composed despite the vehicle’s body flaying from side to side. The quick stop showed how sever weight transfer can bee but the Goodyear shod Velar coped well. Wet braking: The wet braking test allowed us test the new Goodyear against a rival tyre from a premium brand and not some sub standard tyre sourced from China. The Michelin latitude 3 has the same load & speed index and when braking from identical speeds in identical cars on a skid pan coated with a consistent 8mm of water the Goodyear was able to stop some 2.2 metres shorter on average. The Goodyear’s ability to spread its contact patch across more of the road impressed here. The new tyre’s tread blocks and deep channels displaced the standing water very effectively. All of our other testing modules were on the new tyre only and without a direct competitor to gauge against our analysis is a little subjective. Wet handling: On the soaked wet handling circuit we quickly forgot the surface was compromised. The new tyre’s sought out the road surface with gusto and channeled the water away from the tyre’s contact patch very effectively. The level of lateral wet grip proved impressive and only on a long fast right hander in fourth gear with the revs up could I get the car when aggressively driven. The wet braking at both high and low speed proved confidence inspiring. Dry handling: On Goodyear’s 3.4km handling track, with two additional chicanes thrown in to maximize our cornering experience, the tyre was competent and communicative. At the limit of adhesion the tyres would squeal long before washing out wide. Lifting off the throttle brought the big Velar back on track without any drama. The tyre was easy to drive and quite hard to upset. Under heavy braking the weight transfer was handled with aplomb and felt assured. Cornering on the 13-15m wide test track can be interesting as the undulating circuit is very technical but the Goodyear shod Velar performed surprisingly well despite its obvious bulk. The perfect mix: Goodyear tyre tread has up to 20 separate ingredients that can be broken down into six key groups: 1. Polymers, three polymers are used to make the compound, 2. Silica, a very fine and expensive type of sand, 3. Couplers, such as carbon black (that makes the tyre black), processing aids & oils, 4. A cocktail of resins, 5. Protection agents, to stop deterioration/brittleness cause by UV rays etc. and 6. Curatives, to finish the process. Vulcanization is of course the essential cooking method for tyre rubber and it is fitting that the company was named after the inventor of the process Charles Goodyear. The Eagle F1 Asymmetric 3 SUV tyre is classed for summer or standard Irish use. If you need all weather or winter tyres for your SUV Goodyear has its Vector 4 season gen-2 tyre or the pure winter Goodyear Utragrip Performance SUV tyre. Other premium rivals like Bridgestone, Pirelli and Michelin have similar portfolios of tyres. Most motorists have a love hate relationship with their tyres. More often than not the hate comes from having to make a stress purchase as a result of a ticking off from a Garda or an NCT failure when a tyre’s tread dept has dropped below the legal limit of 1.3mm. Ironically tyres with less tread can provide better grip in the dry e.g. racing slicks, this is because more of the tyre’s surface is in contact with the road. Even slick tyres have their limits and if they hit a wet or oily patch the car is going straight to the scene of the accident with little warning. Road tyres have to be more forgiving and progressive, after all they are not being driving by racers with lighting fast reflexes. Because tyre’s are round, black and all pretty much look the same we don’t give them enough attention. Motorists have a duty of care to them selves and other road users to fit the best they can. The introduction of the tyre labelling system has made buying tyres a much easier task. The SUV tyre’s rating depends on size but ranges from A-C for wet grip, A-C for fuel economy and for exterior noise between quiet ‘)’ and moderate ‘))’. Our test tyres were labeled as B / B / ’)’. You want to get a tyre with an A rating in all three categories (wet weather braking, fuel efficiency and exterior road noise) or as close as you can. Going for the budget offering might ultimately be very costly should you find yourself without enough grip in an emergency. The stress of new tyre purchase is more often than not carried out with little user research and without doubt price appears to be most buyers main concern. The big brands have multiple sub brands to cater for market demands much like the washing powder giants. The science of tyre’s making is as impressive to those interested as it is dull to the vast majority. The attention paid to the chemical, mineral and natural rubber concoction in a tyre recipe coupled with its structural steel belted engineering dictates price. In simple terms you get what you pay for and there are lots of retailers who will sell you affordable but sub standard tyre’s that will pass an NCT but fail to provide the stopping and cornering grip of class leading tyres. A metre or two in an emergency stop can make a huge difference. The initial delivery of the new Goodyear tyre is being led by market demand. It will be November this year before the full range becomes completely available. Goodyear with its 120 year history and 65,000 strong workforce dotted across 48 factories in 22 countries knows its market. The family tyre maker also has innovation centres in Akron, Ohio and Colmar-Berg, Luxembourg. I just wish a few of the workforce were assigned to its naming strategy. 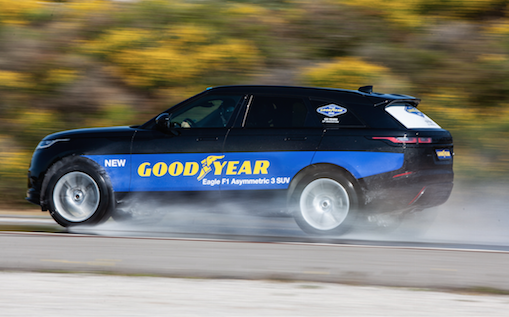 Deep breath, the Goodyear Eagle F1 Asymmetric 3 SUV tyre is a very competent tyre, with excellent grip and braking properties. The starting price for the smallest size is circa €241.